After multiple efforts and extensive efforts at outreach to the talent available, we have been unable to appropriately cast "BabyLand" by Rich Rubin. Out of respect for the playwright Rich Rubin, the director Matt Russell, the actors that auditioned, and, most importantly, our patrons, the Artistic Directors and Executive Board of HART have come to the profoundly difficult decision that we will be removing the production of "BabyLand" from our 24th season. Our desire and commitment to our community is to make certain that every production that the HART team undertakes is executed at the level of quality that our artists and patrons deserve, therefore we have come to the conclusion that we would rather defer this production rather than deliver anything that may not reach the high standard of quality that we expect. This is in no way a reflection on the quality of Rich Rubin's work, the incredible effort and leadership of Matt Russell, or the contributions and talent of the artists that participated in planning, marketing, and auditioning. Every member of the Hillsboro Artists' Regional Theatre organization looks forward to our next opportunity to collaborate with this amazing crew. 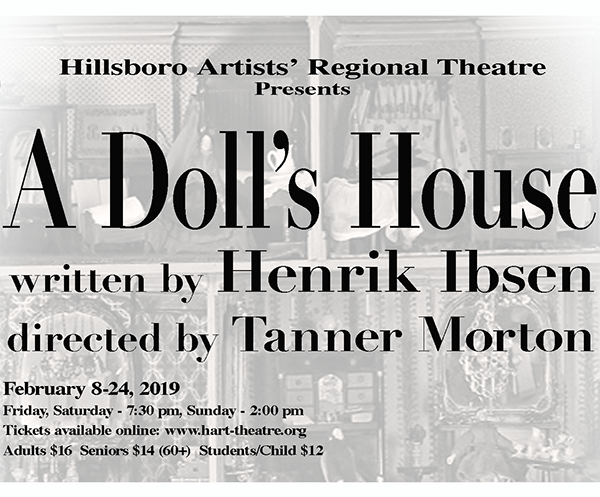 As a replacement we are excited to announce that we will be producing the classic, "A Doll's House" written by Henrik Ibsen and directed by Tanner Morton. There will be more details to come, and all prior reservations for the originally planned production of "BabyLand" will be honored or refunded at the discretion of our patrons. Please forward this email at your discretion, any questions may be referred to Aaron Morrow at AARON.L.MORROW@GMAIL.COM. Ray Hale, a long running board member and past President retires from work and HART, leaving an incredible legacy to the community of Hillsboro. In his 25-year tenure he directed, acted, built and painted sets, hung lighting and curtains, ran sound, applied for royalties, hired directors and cast and crew, recruited board members, applied for grants, worked on policies and procedures, wrote HART's five-year plan, helped write the capital campaign and oversaw the buildout of the new theatre along with other board members. Ray’s smile and good nature will resonate in the hearts and souls of the thousands of people that were fortunate enough to work alongside him, and those that were entertained by his talents over the years. His legacy at HART is the reason the current board decided to honor him with his namesake on the theatre entrance. The now “Ray Hale Auditorium” will welcome the future audience, cast, and crew for the next twenty-five years. 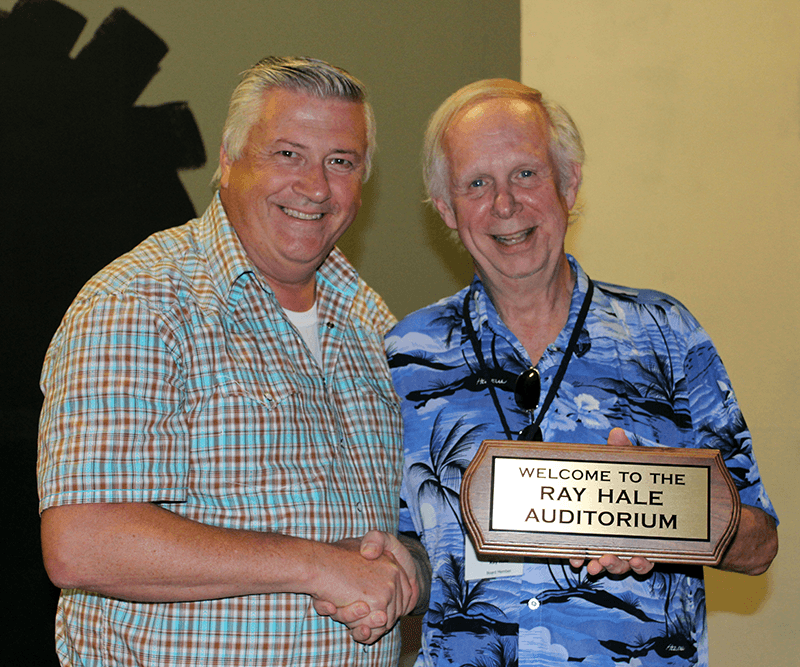 Ray will always be part of this amazing community theatre and will be an advisor to our board for years to come. Doug Sellers, no stranger to HART or the community of Hillsboro assumes the role of HART President once again. A business owner in downtown Hillsboro for the past twenty years, Doug and his wife Dawn own and operate Primrose and Tumbleweeds on Main street and have been very active in the arts community in Hillsboro. Doug is one of the founding members of the Hillsboro Arts and culture council (H.A.C.C. ), and served seven years on that council. Dawn took over his seat and serves on it today. Doug’s theatre history involves working with several theatres throughout Oregon and S.W. Washington. From board member to board President, Doug has served on boards for over thirty-five years. Doug has appeared in and directed numerous shows as well as film and television. Doug’s goal for HART in the next twenty-five years is to still be here and solvent. Doug is putting together a dedicated team of diverse talents to build a strong base to launch our twenty-fifth anniversary. Funding is the main element he is concerned with. Doug’s goal in his first year are to build a full active board, write grants to fund the twenty-fifth season as well as build a financial base for its continuing future, write HART’s new five-year business plan that will take HART to 2024, re-write all roles and responsibilities of board members to achieve a successful future, build a new website and social media presence to enhance the community’s awareness, re-paint the inside of the theatre, remove all unwanted items collected over the past ten years, organize all props, costumes and set pieces, re-design the program, increase our donor list, and last but not least sit in the audience and enjoy the hard work of thousands of very diverse and talented people whom come together volunteering their time and energy to put on a great performance.